Marcel van der Pluijm recently founded the company, Feeling Fresh. "I actually considered taking this step a few times over the last ten years. But there was always a reason not to do it. This year, I turned 48." "It became time to follow my dream before I would regret never doing so at a later stage. After years of working in the export divisions of two fantastic horticultural cooperatives, I wanted to stand on my own two feet. I wanted to make my own decisions and operate on a smaller scale", he explains. As a third-generation vegetable farmer, Marcel has fresh fruit and vegetables in his blood. "My father and grandfather were active in the Rotterdam weekly market their whole lives. They had fresh fruit and vegetable stalls. It is here that I learned the tricks of the trade on weekends and during holidays." I was not allowed to take over my father's stall. I had to complete my studies. I got the best experience at my first job at Minnaar Holland B.V. Here, I started to focus very quickly on the far-off destinations such as North America and the Far East. After a few years, I was responsible for the sales in the USA and Canada. At Minnaar Holland, I laid the foundation for the rest of my career." When asked what his plans are for Feeling Fresh, Marcel answers, "It is in line with the expectation that we will focus on the overseas export markets. North America has been my specialty for more than 25 years. It might also happen that we connect growers with European buyers. At the moment, anything is possible. It is, however, known that from 1 October 2019, we will begin exporting to North America." "Feeling Fresh's mission is to unburden our clients. We also want to have fun doing our work. In the long run, I would like to become a preferred supplier with a group of loyal clients. I want to build longstanding relationships between the farmers, end users, and Feeling Fresh. 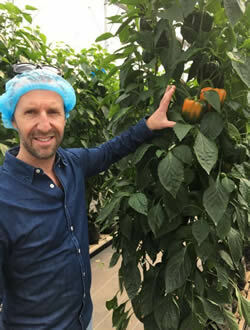 In the end, everything revolves around Passion for Produce - the passion for our great profession and for ensuring that we do our job, every day, with pleasure."